Stratford cycle shelter with a galvanised finish to BS EN ISO 1461 standard and optional end panels. 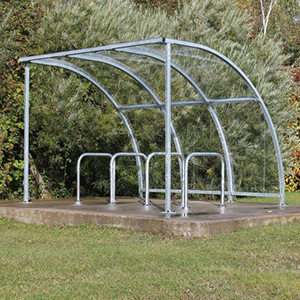 Cycle shelters are commonly seen in schools, colleges, offices and shopping centers. There has been a resurgence in the use of bicycles with increasing enthusiasm about living in an eco-friendly way. 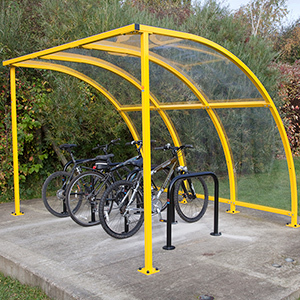 A cycle shelter delivers a hassle-free solution for parking bicycle and it can encourage people to use their bikes if they know there is a dedicated space where they can park and retrieve bicycles securely. 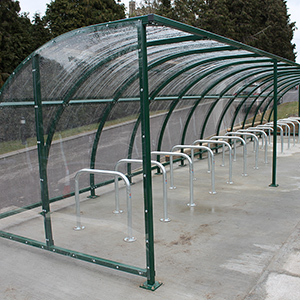 The free-standing, open-ended Stratford cycle shelter is available in bays of varying lengths, ranging from one meter to four meters. You also have the option to order extension bays to match the main bays should you want a larger shelter. The 50 mm x 50 mm x 3 mm SHS steel framework uses a galvanised finish in accordance with the BS EN ISO 1461 standards. The cycle shelter comes with a 4 mm clear PETG UV stabilised sheeting roof. This ensures a sturdy shelter that can withstand challenging weather conditions. 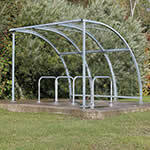 The Stratford cycle shelter is delivered flat packed for ease of handling and simple on-site assembly. It is also supplied flanged for bolting down as standard. Easy to customise, the Stratford cycle shelter has optional extras which include end panels and Zaun mesh doors to create a lockable cycle shelter. You can ask for a ragging kit too for casting the frame into concrete. More options include a powder coated finish to a RAL or BS colour of your choice at an additional cost. A. 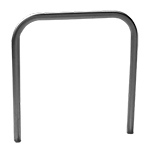 The Sheffield 4 hoop toast rack is 2600mm wide, so a 3 meter cycle shelter will be most suitable.